The mastodon was old, its teeth worn to nubs. It was perfect prey for a band of hunters, wielding spears tipped with needle-sharp points made from bone. Sensing an easy target, they closed in for the kill. Almost 14,000 years later, there is no way to tell how many hits it took to bring the beast to the ground near the coast of present-day Washington state. But at least one struck home, plunging through hide, fat and flesh to lodge in the mastodon's rib. The hunter who thrust the spear on that long-ago day didn't just bring down the mastodon; he also helped to kill off the reigning theory of how people got to the Americas. For most of the past 50 years, archaeologists thought they knew how humans arrived in the New World. The story starts around the end of the last ice age, when sea levels were lower and big-game hunters living in eastern Siberia followed their prey across the Bering land bridge and into Alaska. As the ice caps in Canada receded and opened up a path southward, the colonists swept across the vast unpopulated continent. Archaeologists called these presumed pioneers the Clovis culture, after distinctive stone tools that were found at sites near Clovis, New Mexico, in the 1920s and 1930s. As caches of Clovis tools were uncovered across North America over subsequent decades, nearly all archaeologists signed on to the idea that the Clovis people were the first Americans. Any evidence of humans in the New World before the Clovis time was dismissed, sometimes harshly. That was the case with the Washington-state mastodon kill, which was first described around 30 years ago1but then largely ignored. Intense criticism also rained down on competing theories of how people arrived, such as the idea that early Americans might have skirted the coastline in boats, avoiding the Bering land bridge entirely. “I was once warned not to write about coastal migration in my dissertation. My adviser said I would ruin my career,” says Jon Erlandson, an archaeologist at the University of Oregon in Eugene. To test their ideas, some researchers are examining new archaeological sites and reopening old ones. Others are sifting through the DNA of modern people and unearthing the remains of those buried millennia ago in search of genetic clues. “There's a powerful meshing of the archaeology we're pulling out of the ground with genetic evidence,” says Michael Waters, a geographer at Texas A&M University in College Station. Like those original Americans, researchers are exploring new frontiers, moving into fresh intellectual territory after a long period of stasis. 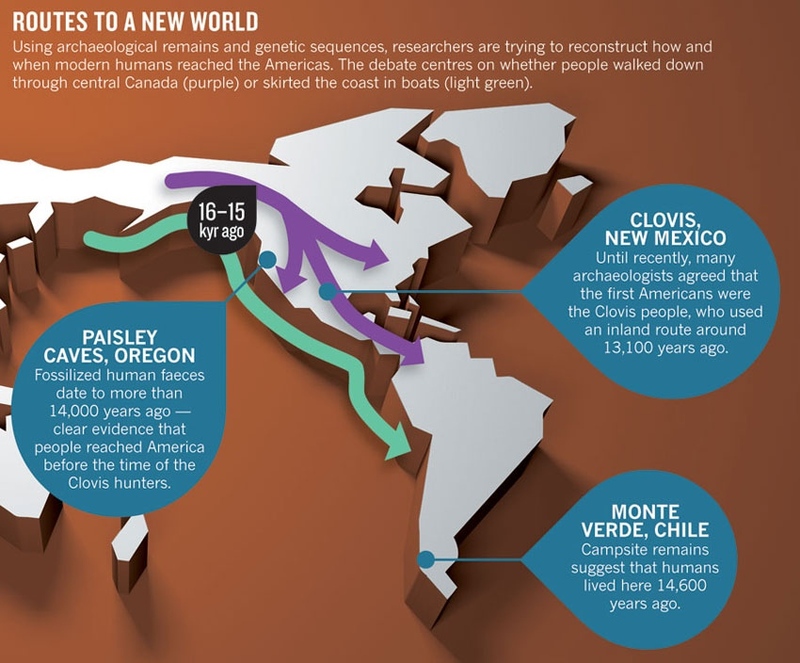 “Clovis has been king for 50 years, and now we have to reimagine what the peopling of the New World looked like,” Erlandson says. “If it wasn't Clovis, what was it? It took a chance finding halfway around the world to set this reappraisal in motion. In the late 1970s, Tom Dillehay, an archaeologist at Vanderbilt University in Nashville, Tennessee, uncovered the remains of a large campsite in southern Chile, close to the tip of South America. Radiocarbon dating of wood and other organic remains suggested that the site was around 14,600 years old, implying that humans made it from Alaska to Chile more than 1,000 years before the oldest known Clovis tools2. But because the remote site was so hard for most researchers to examine, it would take nearly 20 years for Dillehay to convince his colleagues. The case for pre-Clovis Americans has now gained more support, including from analyses of ancient DNA. One of the first bits of genetic evidence came from preserved faeces, or coprolites, that had been discovered in a cave in south-central Oregon by Dennis Jenkins, an archaeologist at the University of Oregon. Radiocarbon dating showed that the coprolites are between 14,300 and 14,000 years old, and DNA analysis confirmed that they are from humans3. The recovered DNA even shared genetic mutations with modern Native Americans. 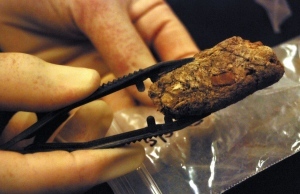 Since the coprolite evidence emerged, in 2008, ancient DNA has also been used to reconstruct that long-ago mastodon hunt. Radiocarbon studies in the 1970s had suggested that the mastodon pre-dated the Clovis people, but some researchers explained that away by arguing that the animal had died in an accident. However, DNA studies last year4 showed that a fragment of bone embedded in the mastodon's rib had come from another mastodon — strong evidence that it was a spear point made by humans and not a shard that had chipped off a nearby bone in a fall. The case against Clovis got another major boost last year, when an excavation in Texas unearthed stone tools that pre-dated Clovis-style artefacts by more than a millennium5. “We found a solid site with good context, good artefacts and solid dating,” says Waters. This slow avalanche of findings has all but buried the Clovis model — the problem now is what to replace it with. The abundant Clovis artefacts and sites discovered over the past century have set a high bar. 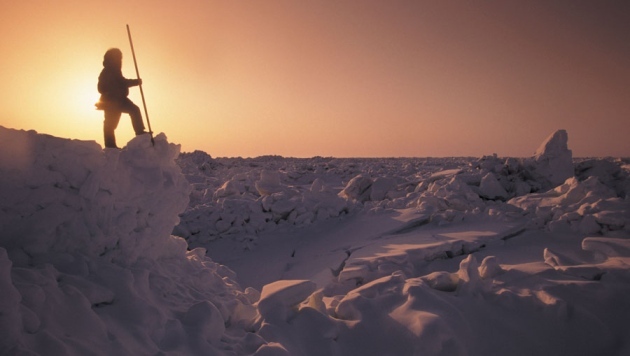 Telling the story of the first Americans means coming up with a plausible explanation and definitive evidence to support it — a combination that researchers are struggling to achieve. One idea they are exploring is that a small group of big-game hunters made it into the Western Hemisphere over land — but significantly earlier than previously thought. Another, more popular, theory argues that humans used boats to navigate along the coast of Siberia and across to the Americas. There is also a controversial variant of the coastal migration model, put forward by archaeologists Dennis Stanford at the Smithsonian Institution in Washington DC and Bruce Bradley at the University of Exeter, UK. Called the Solutrean hypothesis, it suggests that coastal migration from Asia could have been supplemented by parallel migrations across the Atlantic, bringing stone-tool technologies from present-day Spain and southern Europe to eastern North America. DNA studies argue strongly against this hypothesis, and it gets little support from researchers. But some are hesitant to reject the idea outright, recognizing that the community was once before too conservative. “That's what happened with the Clovis paradigm,” says Dillehay. To move the field forward, researchers are using as many types of data as possible. Some key clues have emerged from studies of population genetics, in which researchers tallied the number of differences between the genomes of modern Native Americans and those of people living in Asia today. They then used estimates of DNA mutation rates as a molecular clock to time how long the diversity took to develop. That provides an estimate for when people split from ancient Asian populations and migrated to the Americas. Judging from the limited genetic diversity of modern Native Americans, Ripan Malhi, a geneticist at the University of Illinois at Urbana-Champaign, and others have argued that the founding population was small, perhaps just a few thousand hardy settlers. In a study of mitochondrial DNA from modern Native American and Asian populations, Malhi and his colleagues also found hints that the first American colonists paused on their way out of Asia6, waiting out the peak of the last ice age on the exposed Bering land bridge for perhaps 5,000 years — long enough to become genetically distinct from other Asian populations. When the glaciers blocking their path into North America began to melt around 16,500 years ago, the Beringians made their way south over land or sea, passing those genetic differences on to their descendants in America. Other researchers say that there is a major problem with relying on population genetics to answer questions about the peopling of the Americas. At least 80% of the New World's population was wiped out by disease, conflict or starvation after Europeans first arrived some five centuries ago. And the genes of many Native Americans today carry European and African markers, which confounds efforts to piece together the migration story. “If we look pre-contact, we're going to find a lot more indigenous diversity,” says Malhi. That means going back in time, by studying ancient genomes. “You're going to see a lot of ancient-DNA studies coming out, and that's going to tell a powerful story about the first Americans,” says Waters. The chances of finding well-preserved bones from the first Americans are slim, but valuable information can be pulled from DNA samples that fall in between then and now, argues Eske Willerslev, who studies ancient DNA at the University of Copenhagen. Willerslev and his colleague Thomas Gilbert proved that point in 2010, when they extracted the first complete ancient-human genome from a 4,000-year-old hank of hair found in Greenland that had languished for decades in a museum storeroom in Copenhagen. The DNA helped to show that there had been multiple waves of migration into Greenland, and that modern Greenlanders arrived more recently7. Now, Willerslev's lab is trying to extract similar information about population movements from ancient-human remains from sites all over the Americas.